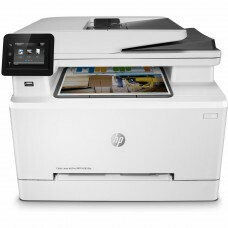 Colour multifunctional printer. Duplex. Printing, copying, scanning, faxing. Consumables: black toner 203A/X (1400/3200K), C, M, Y toners 203A/X (1300/2500K). Start toners: black 1400K, colors 700K. Prints up to 1300 pages (ca 5% A4). Cyan toner.High quality genuine Hewlett-Packard cartridge.Relate..
Prints up to 1300 pages (ca 5% A4). Yellow toner.High quality genuine Hewlett-Packard cartridge.Rela..
Prints up to 1300 pages (ca 5% A4). Magenta toner.High quality genuine Hewlett-Packard cartridge.Rel..
Prints up to 3200 pages (ca 5% A4). Black toner.High quality genuine Hewlett-Packard cartridge.Relat..
Prints up to 2500 pages (ca 5% A4). Cyan toner.High quality genuine Hewlett-Packard cartridge.Relate..
Prints up to 2500 pages (ca 5% A4). Yellow toner.High quality genuine Hewlett-Packard cartridge.Rela..
Prints up to 2500 pages (ca 5% A4). 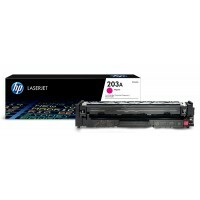 Magenta toner.High quality genuine Hewlett-Packard cartridge.Rel..
Prints up to 1400 pages (ca 5% A4). Black toner.High quality genuine Hewlett-Packard cartridge.Relat..